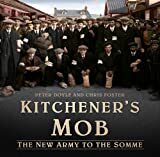 This is the story of the raising of Kitchener’s Army, from the earliest days of recruitment, through to the creation of whole "Pals" battalions across the country, and beyond. This book follows the journey of these men, born to fight together, through an amalgam of words and images. Their path to the Somme, and the tragedy of the July 1, 1916 and beyond, had a huge effect on the communities these friends came from; the artifacts they left behind bear witness to that never-forgotten imprint on history that were the Pals Battalions. This book should be treasured by every community throughout Britain as a tribute to this generation. Peter Doyle is a military historian specializing in the role of terrain in warfare. He is the author of The First World War in 100 Objects. Chris Foster is an artist and photographer. He developed the website "Craven’s Part in the Great War" as a memorial to the men of Craven who served in World War I.